A telephone line or telephone circuit is a single-user circuit on a telephone communication system. This is the physical wire or other signaling medium connecting the user's telephone apparatus to the telecommunications network, and usually also implies a single telephone number for billing purposes reserved for that user. Telephone lines are used to deliver landline telephone service and Digital subscriber line (DSL) phone cable service to the premises. Telephone overhead lines are connected to the public switched telephone network. Plain old telephone service (POTS), or plain ordinary telephone service, is a retronym for voice-grade telephone service employing analog signal transmission over copper loops. POTS was the standard service offering from telephone companies from 1876 until 1988 in the United States when the Integrated Services Digital Network (ISDN) Basic Rate Interface (BRI) was introduced, followed by cellular telephone systems, and voice over IP (VoIP). POTS remains the basic form of residential and small business service connection to the telephone network in many parts of the world. 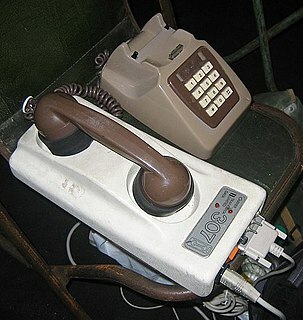 The term reflects the technology that has been available since the introduction of the public telephone system in the late 19th century, in a form mostly unchanged despite the introduction of Touch-Tone dialing, electronic telephone exchanges and fiber-optic communication into the public switched telephone network (PSTN). A DSL filter is an analog low-pass filter installed between analog devices and a plain old telephone service (POTS) line. The DSL filter prevents interference between such devices and a digital subscriber line (DSL) service connected to the same line. Without DSL filters, signals or echoes from analog devices at the top of their frequency range can reduce performance and create connection problems with DSL service, while those from the DSL service at the bottom of its range can cause line noise and other problems for analog devices. In telecommunications and computing, bit rate is the number of bits that are conveyed or processed per unit of time. In a telecommunications network or computer network, downstream refers to data sent from a network service provider to a customer. In computer networking, upstream refers to the direction in which data can be transferred from the client to the server (uploading). This differs greatly from downstream not only in theory and usage, but also in that upstream speeds are usually at a premium. Whereas downstream speed is important to the average home user for purposes of downloading content, uploads are used mainly for web server applications and similar processes where the sending of data is critical. Upstream speeds are also important to users of peer-to-peer software. A symmetric digital subscriber line (SDSL) is a digital subscriber line (DSL) that transmits digital data over the copper wires of the telephone network, where the bandwidth in the downstream direction, from the network to the subscriber, is identical to the bandwidth in the upstream direction, from the subscriber to the network. This symmetric bandwidth can be considered to be the opposite of the asymmetric bandwidth offered by asymmetric digital subscriber line (ADSL) technologies, where the upstream bandwidth is lower than the downstream bandwidth. SDSL is generally marketed at business customers, while ADSL is marketed at private as well as business customers. The Pontop Pike transmitting station is a facility for telecommunications and broadcasting situated on a 312-metre (1,024-ft) high hill of the same name between Stanley and Consett, County Durham, near the village of Dipton, England. The mast is 149 metres (489 ft) high, giving an average antenna height of 461 metres (1,512 ft) above sea level. It is owned and operated by Arqiva. 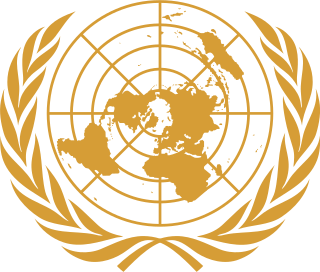 The ITU Telecommunication Standardization Sector (ITU-T) is one of the three sectors of the International Telecommunication Union (ITU); it coordinates standards for telecommunications. ISDN Digital Subscriber Line (IDSL) uses ISDN-based digital subscriber line technology to provide a data communication channel across existing copper telephone lines at a rate of 144 kbit/s, slightly higher than a bonded dual channel ISDN connection at 128kbit/s. The digital transmission bypasses the telephone company's central office equipment that handles analogue signals. IDSL uses the ISDN grade loop without Basic Rate Interface in ISDN transmission mode. The benefits of IDSL over ISDN are that IDSL provides always-on connections and transmits data via a data network rather than the carrier's voice network. Joseph W. Lechleider's contribution to DSL was his insight that an asymmetric arrangement offered more than double the bandwidth capacity of symmetric DSL. This allowed Internet service providers to offer efficient service to consumers, who benefited greatly from the ability to download large amounts of data but rarely needed to upload comparable amounts. ADSL supports two modes of transport—fast channel and interleaved channel. Fast channel is preferred for streaming multimedia, where an occasional dropped bit is acceptable, but lags are less so. Interleaved channel works better for file transfers, where the delivered data must be error-free but latency (time delay) incurred by the retransmission of error-containing packets is acceptable. The theoretical foundations of DSL, like much of communication technology, can be traced back to Claude Shannon's seminal 1948 paper: A Mathematical Theory of Communication . Generally, higher bit rate transmissions require a wider frequency band, though the ratio of bit rate to symbol rate and thus to bandwidth are not linear due to significant innovations in digital signal processing and digital modulation methods. It is also commonly called a UNE (for unbundled network element) in the United States; in Australia it is known as a ULL (unconditioned local loop);  in Belgium it is known as "raw copper" and in the UK it is known as Single Order GEA (SoGEA). It started making a comeback in the United States in 2004 when Qwest started offering it, closely followed by Speakeasy. As a result of AT&T's merger with SBC,  and Verizon's merger with MCI,  those telephone companies have an obligation to offer naked DSL to consumers. Even without the regulatory mandate, however, many ILECs offered naked DSL to consumers. The number of telephone landlines in the United States dropped from 188 million in 2000 to 115 million in 2010, while the number of cellular subscribers has grown to 277 million (as of 2010). This lack of demand for landline voice services has resulted in the expansion of naked DSL availability. Modern DSL gateways often integrate routing and other functionality. Their initialization is very similar to a PC boot up. The system image is loaded from the flash storage; the system boots, synchronizes the DSL connection and finally establishes the internet IP services and connection between the local network and the service provider, using protocols such as DHCP or PPPoE. According to Implementation and Applications of DSL Technology (2007), the PPPoE method far outweighed DHCP in terms of deployment on DSLs, and PAP was the predominant form of subscriber authentication used in such circumstances. The system image can usually be updated to correct bugs, or to add new functionality. Very-high-bit-rate digital subscriber line (VDSL) and very-high-bit-rate digital subscriber line 2 (VDSL2) are digital subscriber line (DSL) technologies providing data transmission faster than asymmetric digital subscriber line (ADSL). 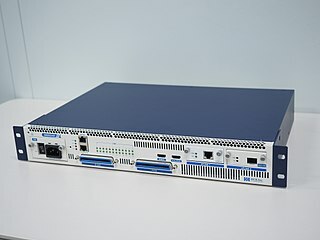 A digital subscriber line access multiplexer is a network device, often located in telephone exchanges, that connects multiple customer digital subscriber line (DSL) interfaces to a high-speed digital communications channel using multiplexing techniques. Single-pair high-speed digital subscriber line (SHDSL) is a form of symmetric digital subscriber line (SDSL), a data communications technology for equal transmit and receive data rate over copper telephone lines, faster than a conventional voiceband modem can provide. As opposed to other DSL technologies, SHDSL employs trellis-coded pulse-amplitude modulation (TC-PAM). As a baseband transmission scheme, TC-PAM operates at frequencies that include those used by the analog voice plain old telephone service (POTS). As such, a frequency splitter, or DSL filter, cannot be used to allow a telephone line to be shared by both an SHDSL service and a POTS service at the same time. Support of symmetric data rates made SHDSL a popular choice by businesses for private branch exchange (PBX), virtual private network (VPN), web hosting and other data services. In telephony, pair gain is the transmitting of multiple POTS signals over the twisted pairs traditionally used for a single traditional subscriber line in telephone systems. Pair gain has the effect of creating additional subscriber lines. This is typically used as an expedient way to solve subscriber line shortage problems by using existing wiring, instead of installing new wires from the central office to the customer premises. The term was invented in the middle 20th century by analogy with earlier use of gain to extend telephone local loops far from the telephone exchange. Rate-adaptive digital subscriber line (RADSL) is a pre-standard asymmetric digital subscriber line (ADSL) solution. RADSL was introduced as proprietary technology by AT&T Paradyne, later GlobeSpan Technologies Inc., in June 1996. In September 1999, RADSL technology was formally described by ANSI in T1.TR.59-1999. RADSL supports downstream data rates of up to approximately 8 Mbit/s, upstream data rates up to approximately 1 Mbit/s, and can coexist with POTS voice on the same line. ITU G.992.5 is an International Telecommunication Union standard for asymmetric digital subscriber line (ADSL) broadband Internet access. The standard has a maximum theoretical download speed of 24 Mbit/s. Utilizing G.992.5 Annex M upload speeds of 3.3 Mbit/s can be achieved. In telecommunications, ITU G.992.2 is an ITU standard for ADSL using discrete multitone modulation. G.lite does not strictly require the use of DSL filters, but like all variants of ADSL generally functions better with splitters. ITU G.992.3 is an ITU standard, also referred to as ADSL2 or G.dmt.bis. It optionally extends the capability of basic ADSL in data rates to 12 Mbit/s downstream and, depending on Annex version, up to 3.5 Mbit/s upstream. ADSL2 uses the same bandwidth as ADSL but achieves higher throughput via improved modulation techniques. Actual speeds may decrease depending on line quality; usually the most significant factor in line quality is the distance from the DSLAM to the customer's equipment. 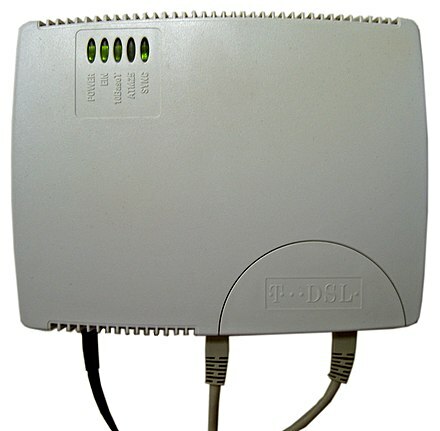 A digital subscriber line (DSL) modem is a device used to connect a computer or router to a telephone line which provides the digital subscriber line service for connectivity to the Internet, which is often called DSL broadband. An Ethernet extender is any device used to extend an Ethernet or network segment beyond its inherent distance limitation which is approximately 100 metres (330 ft) for most common forms of twisted pair Ethernet. These devices employ a variety of transmission technologies and physical media. High-bit-rate digital subscriber line (HDSL) is a telecommunications protocol standardized in 1994. It was the first digital subscriber line (DSL) technology to use a higher frequency spectrum over copper, twisted pair cables. HDSL was developed to transport DS1 services at 1.544 Mbit/s and 2.048 Mbit/s over telephone local loops without a need for repeaters. Successor technology to HDSL includes HDSL2 and HDSL4, proprietary SDSL, and G.SHDSL. A DSL loop extender is a device that a telephone company can place between subscriber premises equipment and central office interfaces to extend the distance and increase the channel capacity of digital subscriber line (DSL) connections. ADSL repeaters are deployed by rural telephone companies trying to provide rural Internet service to farms and small towns where it is impractical to place the DSLAM closer to the subscriber. Typical distance improvements with a loop extender are shown in the diagram below, with rate in megabits per second and distance in thousands of feet. The prevalent means of connecting to the Internet in Germany is DSL, introduced by Deutsche Telekom in 1999. Other technologies such as Cable, FTTH and FTTB (fiber), Satellite, UMTS/HSDPA (mobile) and LTE are available as alternatives. 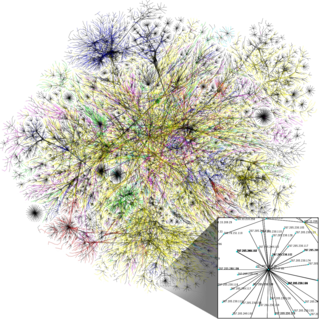 The United Kingdom has been involved with the Internet since it was created. The telecommunications infrastructure provides Internet access to businesses and home users in various forms, including cable, DSL, and wireless. The Internet country code top-level domain (ccTLD) for the United Kingdom is .uk and is sponsored by Nominet. A modem is a hardware device that converts data between transmission media so that it can be transmitted from computer to computer. The goal is to produce a signal that can be transmitted easily and decoded to reproduce the original digital data. Modems can be used with any means of transmitting analog signals from light-emitting diodes to radio. A common type of modem is one that turns the digital data of a computer into modulated electrical signal for transmission over telephone lines and demodulated by another modem at the receiver side to recover the digital data. ↑ Ronald Shamus. "EE535 Homework 3". Worcester Polytechnic Institute. Archived from the original on April 12, 2000. Retrieved September 15, 2011. ↑ [https://www.btwholesale.com/assets/documents/Fibre_Broadband/BTW_Next_Generation_Fibre_Jan_2017.pdf Retrieved on 2017-10-18. ↑ "Federal Communications Commission Approves SBC/AT&T Merger". www.sbc.com. October 31, 2005. ↑ Broadband Forum (2016-07-01). "TR-348 Hybrid Access Broadband Network Architecture" (PDF). Retrieved 2018-07-01. Wikimedia Commons has media related to Digital Subscriber Line .